Near the outskirts of Nevada, Iowa lie the ruins of Oak Park Academy, a boarding school built by the Seventh Day Adventist Church in 1911. Invigorated from a morning spent in Lehigh, Iowa, home of the beautiful ruins of an abandoned brick yard, I got back on the road and continued eastward. An hour-long drive through Iowa's beautiful countryside brought me to the city of Nevada, Iowa. 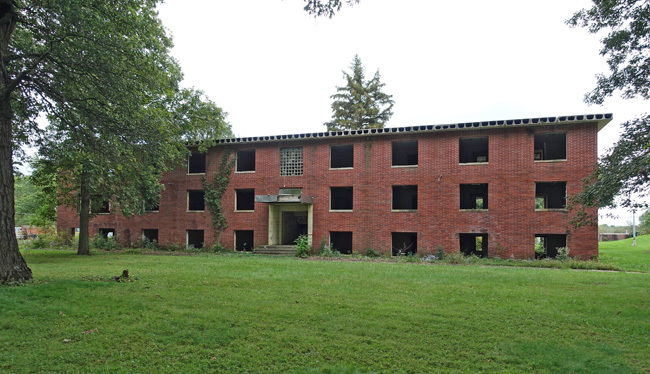 Along its southern edge lay the remains of Oak Park Academy, a high school-level coed boarding school operated by the Seventh Day Adventists of Iowa. T. H. Jeys founded the school in 1902 under the name Iowa Industrial Academy. For the first year, classes were held for its inaugural class of 35 students in the rented Baldum Hotel in Stuart, Iowa. 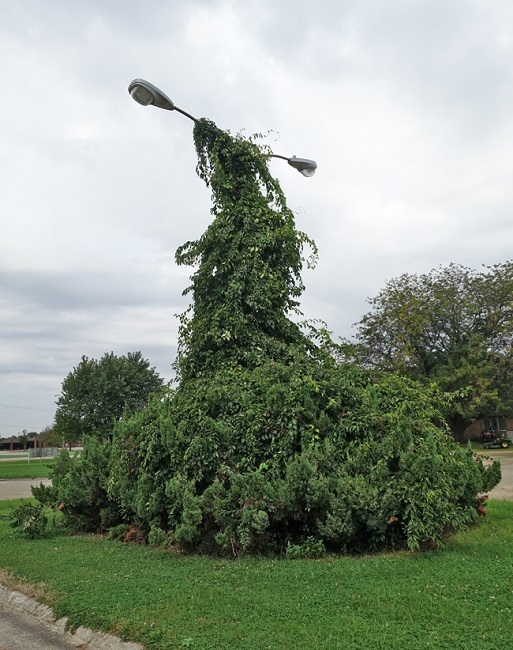 The following year, it moved to a piece of farmland on the eastern edge of the town. The name later changed to Stuart Academy. In 1911 the school was renamed Oak Park Academy and moved to Nevada, Iowa, where it remained until its closure in the spring of 1980. The campus lawn is surprisingly well-maintained, probably due to the fact that the property is not entirely abandoned. 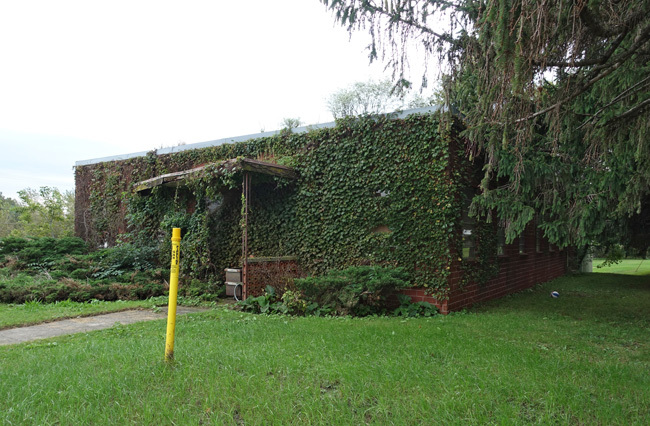 The Seventh Day Adventist Church near the entrance to the former campus is still operational. Across the parking lot stands the Oak Park Estates apartment complex, which occupies the renovated structure of one of the old dormitories. The other four buildings at the far end of the well-kept grounds continue to stand vacant, as they have for more than 35 years. 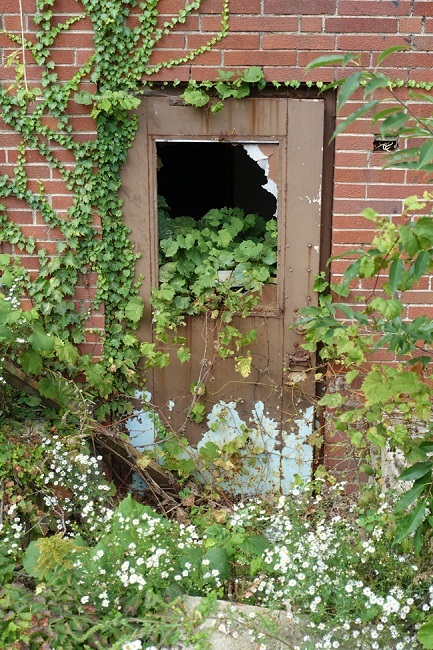 Intensely curious, but not wanting to disrespect the owners of the land, I crossed the lawn and approached the ivy-covered structures. 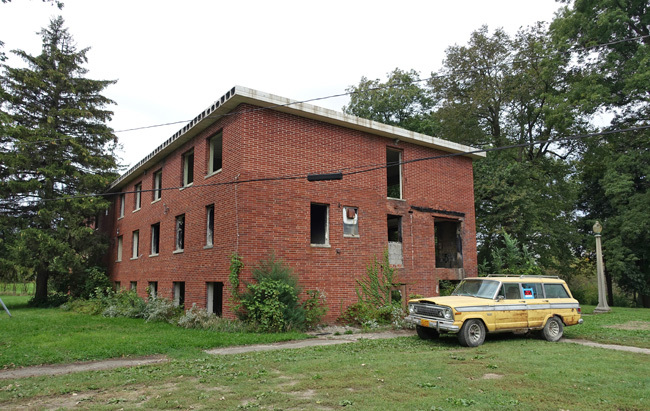 The abandoned dormitory is in very rough shape. Nearly all the windows are gone, giving it a haunting empty appearance. The entrance is marked with graffiti. The spray painted image of a hand with its middle finger raised clashes with the bible verse etched above the doorway urging people to love one another. 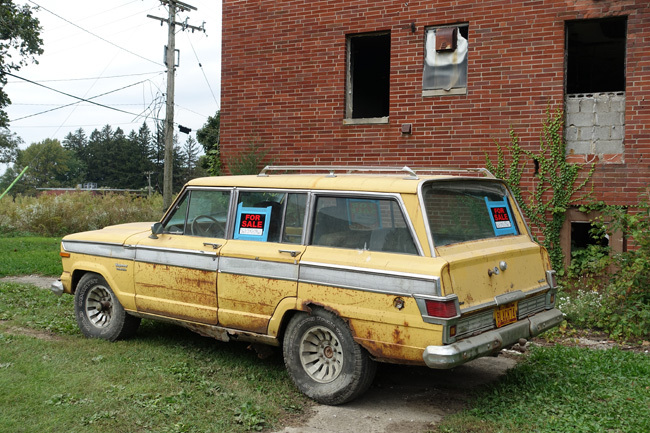 A rusty yellow station wagon with a For Sale sign is parked just outside the overgrown side entrance. Judging by the fact that it's parked behind an abandoned building, I'm pretty sure the owner has given up on finding a buyer. A few other old vehicles are parked between the old dorm and another building, which might have contained the gymnasium. Unlike the dorm, it was fairly well sealed up and the windows were mostly intact. Some were covered with blue tarps on the inside. Figuring it might be occupied by squatters or used for storage of groundskeeping equipment, I decided to take a few pictures of the outside and call it a day. 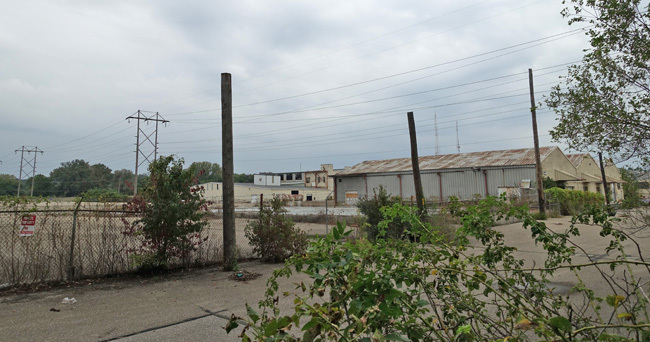 From Nevada, Iowa, I drove down to Des Moines to check out the abandoned Titan Tire factory. On the highway, I passed a teenager who had smashed his shiny sports car into a telephone pole. The front end was completely smashed, and the car was obviously totaled. Fortunately the driver appeared uninjured as he stood talking to a police officer. I shook my head in silent judgment, figuring the kid was probably driving recklessly and lost control. 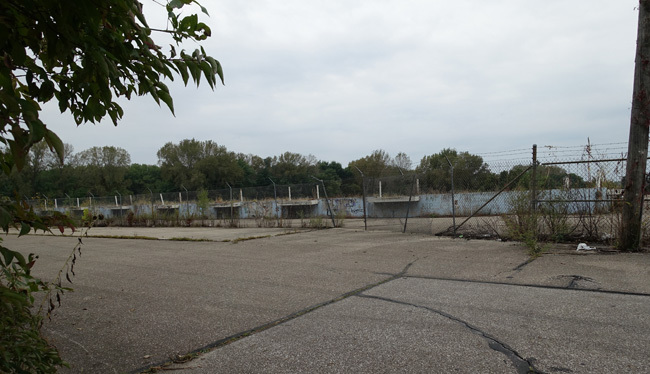 I arrived at Titan tire, eager to explore the vast abandoned industrial space and its rusty machinery and artifacts. The place was so huge that it would easily keep me occupied for the rest of the afternoon. My excitement came to an abrupt end when I spotted a utility truck and a group of men in orange vests outside performing some sort of maintenance work. For an instant I wondered if I could sneak past them undetected. Then I thought of the teenager with the smashed car whom I had silently judged for his assumed recklessness and I couldn't justify taking such a risk. I reminded myself that I'd soon be in Detroit, where there would be plenty more abandoned factories to explore. 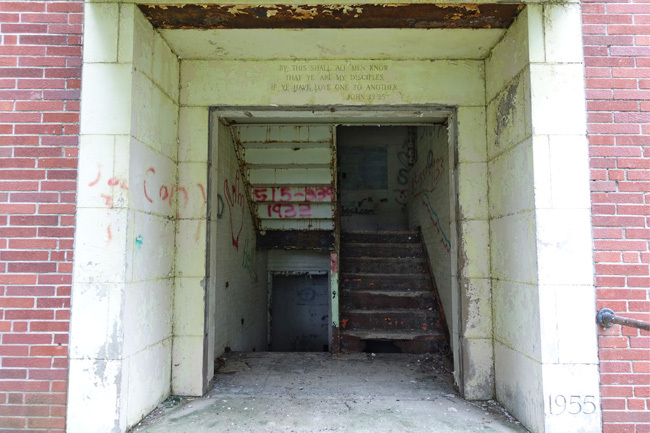 I got back in my car and continued east toward the town of Searsboro, where the abandoned ruins of Searsboro Consolidated School awaited me. Come back next week to hear all about it! I think that yellow station wagon would be a neat "travel" vehicle! It would be a great travel vehicle! I'm guessing it's a fixer-upper though. Dying towns would be a great theme for a road trip. I've focused mostly on abandoned places, but I also really enjoy visiting small towns that are still inhabited. They have so much character. I especially love stopping for a bite to eat at small town diners. Best website for urban/rural abandoned adventurer! If you're ever in Colorado, check out Canyon City's Mount St Scholastica abandoned school and the beautiful "Bendictine Abbey" former boys high school, still "living" but only as a memorial and winery. I've been through Colorado a few times, but haven't ever been to Canyon City. I'll have to check it out next time. Thanks for the tip! Thank you for the walk down memory lane. I went to school there until it closed and was there off and on for several years after it closed. 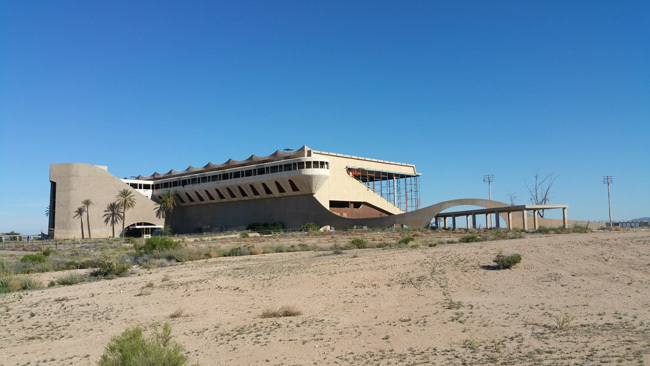 The building you refer to with the cars in it was in fact the gymnasium and also served as a meeting place for church camp meetings or large group school functions. I remember many Saturday Night movies and band concerts there. The building stands on the foundation of an even older sanitarium and from what I understand some of the old rooms and hallways still exist under the floor of the gym but there is no access to them. Now THOSE would be some pictures :) Legend has it that the building is haunted by the ghosts of some who died in the fire that destroyed the old sanitarium. I've spent a few late nights there hoping to see evidence of them as a kid but did not see anything. Thanks for all the great info, Tim! I had no idea that the gymnasium was built over an old sanitarium. It would be amazing to see what traces of the old structure remain down there. Thank you for sharing your memories of your time at Oak Park! Your history of the school seems to be pretty accurate from what I have learned of it. However, the current status of some of these buildings is not. The old dorm has been condemned by the city and is supposed to be torn down but complications with getting large equipment in to do so are holding things up. 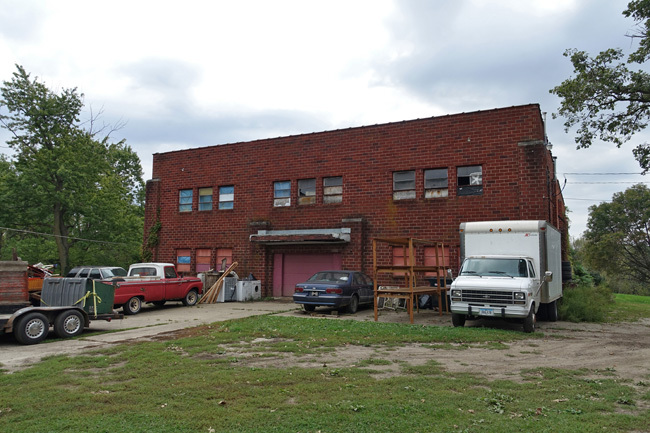 The old gymnasium is a working hobbyist auto shop which is why the many vehicles sitting outside and being well buttoned up. The gym is placed exactly on or over the foundation of the old sanitarium. I can tell you that there is for sure still concrete from the sanitarium under the floor of the gym but I do not know about the wall and rooms. Cool. Thanks for the info. I'm glad someone is putting the gold gym to good use. Amazing! Thank you so much for sharing! It's nice to hear such a positive memory about a sanitarium. Usually people only talk about the negative.